Ok, I just re-installed Battlefield 2124 yesterday and have spent a bit of time playing it, and I must say I am thoroughly impressed and jubilant. What an amazing game! There are hardly any servers left, but the ones you can find are as action packed and fun as the "good ol" days back in 2006...When it was released... I know, amazing to think that old games could still be fun (next thing you know everyone will be playing pong). But the aspect of BF2142 that actually made me think of making a new post (which no one will read as this blog has no readers to my great dismay), was that this battlefield game actually has the "battlefield" feeling to it. And no, I am not referring to the feeling of an actual battlefield as that would be silly (people who claim video games are realistic irk me). I am referring to however, the classic battlefield feeling that the franchise used to have, as seen in BF 1942 and BF 2. The gameplay gives the average player a feeling of a grim, meat grinder type infantry battle, while providing those lucky enough to find a driver's seat in a tank the feeling of a giant squishing bugs. No need for flashy, over the top, mega computer special effects and graphics that really only serve to cover up for the lack of original and enjoyable gameplay (like buying pre spiced meat at the grocery store to cover up the fact that it is two weeks old). 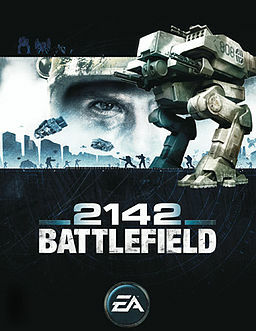 2142 just utilizes unique and exciting gameplay to immerse the player in an action packed futuristic warzone, that's it. It just blows every other battlefield made after it out of the water (in my opinion), and the short amount of time I have been playing served as a really nice way to remember what the franchise used to be like. I will end this post here however, as writing a review for a game made in 2006 would be a very poor way to spend my time, despite how much I would enjoy writing it. I will instead urge those who have this game to reinstall and play, or those who want to join this amazing game to purchase it on Origin for the fantastic, mind boggling sale price of $7.49. The game will survive at least another year I would imagine, if not longer, so it would be money well spent! (not really, still a videogame). Buy Battlefield 2142 From Origin Here! Hope you enjoyed reading, and please comment and subscribe! Perhaps with your support one day this infant blog of mine can actually grow into something. Thanks! Great post. I feel the same way. Glad to see some feedback, and even more glad you share my views! I was just irritated when the new battlefields started to lose their feel. Thanks for commenting!